Yes its been awhile since I've written my blog but I will rectify that! 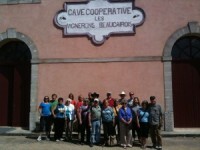 In May, I took an amazing group of travelers to Provence. They were all members of the Cliff Creek Winery wine club. What fun we had! I could not have been luckier. Everyone was fabulous! We are all still in a food coma I am sure. We drank wonderful wines, stayed in the most gracious of boutique hotels and even attended the Fete de Transhumance in St. Remy. This was the trailing of the sheep to the summer pastures. A most loved festival that happens all over Provence in May. 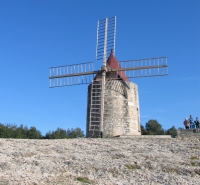 Of the many windmills that used to dot the hillsides of Provence, only a very few remain. This is certainly one of the most picturesque. It was named after Alphonse Daudet who never actually lived here but was inspired to write his "Lettres de Mon Moulin". It was a collection of tales about life in rural Provence in the late 19th century.